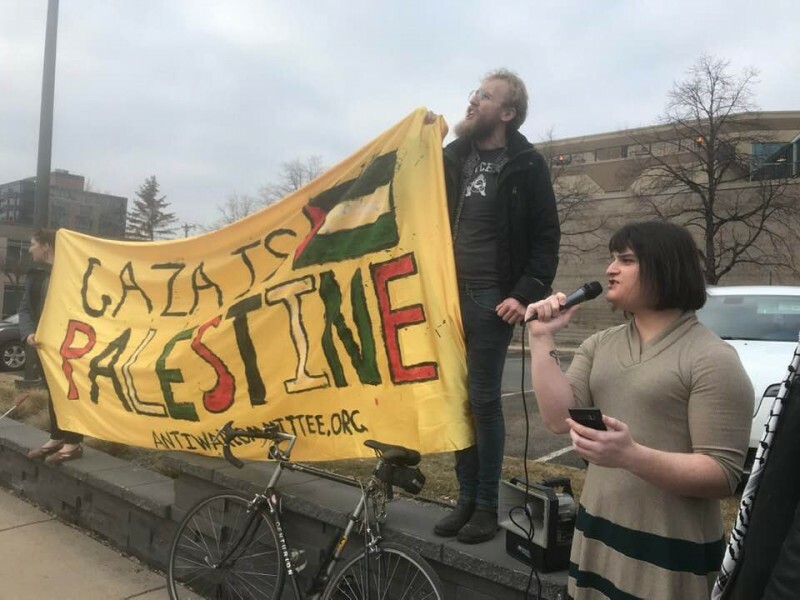 Minnesotans show solidarity with Gaza during Final Four tournament | Fight Back! 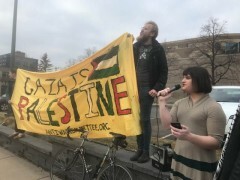 Minneapolis, MN - The Anti-War Committee and Women Against Military Madness held a picket in front of Senator Amy Klobuchar’s office, April 5, to draw attention to her record of voting for U.S. military aid to Israel and her recent meeting with AIPAC during its national convention. The action was during the opening day for the Final Four basketball tournament, which was also in downtown Minneapolis. Basketball fans heard chants of “From Mexico to Palestine, all the walls have got to go!” and “Heh, Klobuchar don’t you know? Aid to Israel has got to go!” as they drove towards US Bank Stadium. April marks the 71st anniversary of the Deir Yassin massacre, in the Palestinian village where in 1948 100 men, women and children were systematically murdered by Israeli commandos. Every year Palestinians across the world mark Deir Yassin and demand the right to return to their homeland. This year, however, the Deir Yassin anniversary coincides with a growing resistance movement in Gaza and an ongoing brutal Israeli military response.